If you are looking for a new USB cable we have all you need. 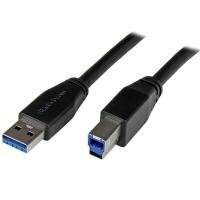 Any length of cable from 0.3 to 20 metres is available and you can choose from USB 2.0 or super-fast USB 3.0. You will also find different cable types, A to B, A to micro B etc., and different colours to. Here at Ebuyer we have a wide range of USB cables & accessories, everything to link your computer with all your peripherals and other USB devices. Order today to take advantage of our low prices and swift delivery service.